Unlike its predecessor, This Was, this album sounds like Jethro Tull. It is more polished and more carefully arranged. Hooks of a rhythmic nature were inserted into nearly every available nook and cranny, giving it a sound that is less blues and more prog. 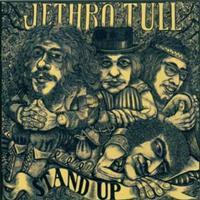 This Was would most likely be of interest only to Jethro Tull completists, collectors who must have all the discs – Stand Up, on the other hand, is worthy of the Tull brand and should be near the top of the must-own list for all fans of the band. Written in 3 / 4 time, this song still has the blues stylings evident on This Was, complete with a four-bar riff that serves as the constant theme, but that musical line is very catchy, off-beat, and it is divided among several instruments giving it a richer sound. The chord progressions during the choruses are much more complex than the I-(IV)-V-I patterns that seemed to fill their previous album. Already, by the very first number, the band seems to be headed in a more progressive direction. This is a jazzy syncopated version of a piece by Johann Sebastian Bach that was written to be neither jazzy nor syncopated. Glenn Cornick shines on the bass guitar, as well as Ian Anderson (of course) on the flute. Track four here has a straightforward A-B-C-A-B-C-C structure, with the A’s and B’s being mellow verses and bridges, and the C’s being hard-driving choruses. The last C is an extended instrumental chorus in which Anderson and Cornick both supply aggressive improvisation. Featuring a soft acoustic guitar and barely-audible piano, this track is mellow, gentle, and ballad-like. This is the quiet track that gives contrast to the two more energetic pieces that surround it. This is my favorite song on the album, and probably the most famous, being a good example of how melodic hooks should not be restricted to the vocal line; even the spaces between lines in each verse can be (and should be) filled with hooks supplied by the musicians. At one point in this piece, I could hear a sharp breath between flute phrases, a sound that would become very common on future Tull albums. On this disc, I only heard it the one time. It also demonstrates that the flute can really rock! The album’s credits list Anderson as playing a mandolin and balalaika, and this is the song where I hear those things, played over Clive Bunker’s bongos. Short, snappy, and catchy, the lyrics seem to imply that the band doesn’t take itself too seriously: “Don’t wanna be a fat man / People would think that I was just good fun / Would rather be a thin man / I am so glad to go on being one.” Rather than being pointedly prejudiced against weight-challenged people, this tune instead seems to be a little bit silly, in Jethro Tull’s typical smarmy snarky way. This begins like a sad ballad, in a minor key, with acoustic guitar laid over acoustic guitar, but when it gets to the instrumental middle section, the same chord progressions are delivered in a hard-driving way, with electric guitar laid over acoustic guitar, and aggressive guitar leads filling every lull in the vocals. This track is not one of the catchiest on the album, but then again, it is track number eight – a good place for it. This is one of the prettiest things I’ve ever heard from Jethro Tull. Flute and soft organ sounds are well layered over the strumming of an acoustic guitar, the melody lines (both vocal and flute) are contagious, and the orchestra that arrives about halfway through the song complements the mood perfectly. The bridges that introduce the verses are also rhythmically complex and very pleasing to my prog-oriented tastes. A fitting encore, this track is energetic, loud, and played with intensity. Although not the most meticulously arranged piece on the disc, it is the hardest and the loudest. When the last chorus winds up for the big finish, the band slows down and milks the final chord for all it is worth, with the usual ad-lib drum riffs and guitar riffs that one would expect from the end of an encore. Finally, amid much fanfare, the final chord ends with a flourish. And then, after four full seconds of silence, the drummer comes back with some rim shots, and then bam, the entire band is back, playing an extended minute-long coda, full-bore, in top gear.